I am an incoming freshman. I will be majoring in Middle/Secondary Education. Although I am a resident of Louisville, Kentucky, the move is still a big deal for my family. I may not be going far from home but the transition is a change that definitely comes with some stress. Tip #1: Get on the last minute essentials run! We have procrastinated it as much as humanly possible, so let’s get on it, shall we? 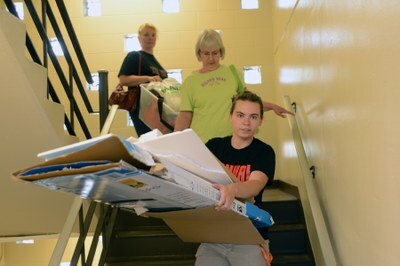 Luckily the University of Louisville has partnered up with Dorm It Up, an affordable furnishing and supplies service. Dorm It Up is available online and delivers right to your dorm within 3 easy steps: Select your package, choose a color, and get it delivered right to your door! Tip#2: Check Ulink, Cardmail, and Blackboard faithfully! Depending on your major, classes, clubs and activities, the University of Louisville’s staff and sponsors are constantly updating students on various events, sending alerts and posting assignments. Getting accustomed to these three sites will definitely be a way of getting head of the game. Tip #3: Begin/complete AlcoholEdu and Haven! These two requirements are a way for you to school policy on sexual assault and alcohol consumption. REMEMBER: Every entering undergraduate student is required to complete AlcoholEdu and Haven. Failure to do so will result in a hold that prevents registration for the next semester. Tip #4: Begin/complete your STOMP Modules! The First Year Initiative modules are a way to give you viable knowledge of campus life, the layout, where and when you can receive academic and psychological aid. These modules are assigned to you on Blackboard under your Orientation Course. Tip #5: Make the most of your last week (or so) at home! The move may just be harder on your parents than it is on you. Be courteous and understanding of their nervousness. Follow the tips above and eliminate unnecessary and unwanted stress on everyone’s part. And don't forget to check out more move in information on the housing website!